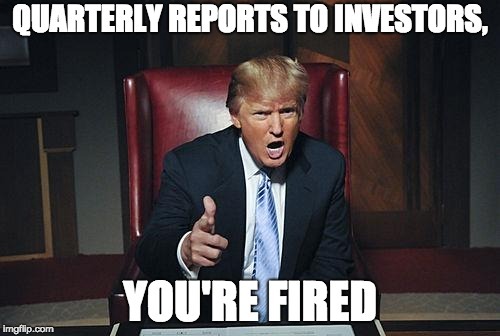 Many moons ago — OK, actually 10 days ago, but that qualifies as many moons ago these days — President Trump floated the idea of letting U.S. companies adopt to semiannual corporate reporting rather quarterly. For a day we were all verklempt, torn between the lure of less short-term focus on Wall Street and our unease of giving investors less information about the shares they own. Trump’s semiannual reporting idea hasn’t died. Rather, like so many of his outbursts, it streaked across the day’s stage and then vanished. Still, as we talk amongst ourselves about semiannual reporting, let’s remember two important points. First, Trump’s idea will probably never happen. It wasn’t even an idea, as much as a thought someone put into his head that rattled around for a few days and then spilled into his Twitter stream. Trump was simply looking for a diversion from other political problems, and a sop he could throw to the business community now that last year’s tax cuts are done. Second (and more relevant to compliance officers), even if semiannual reporting does come to pass, that won’t solve the problem corporations and investors actually face: a slavish devotion to delivering short-term results. Let’s start with Trump broaching the idea itself. Semiannual reporting isn’t something new under the sun. It’s already allowed in Europe. Canada offered a similar proposal last year for public comment. The regulatory rollback crowd has talked about reduced quarterly reporting for years, most recently in a proposal released in April. Trump claims that Indra Nooyi, the departing CEO of Pepsico, mentioned semiannual reporting to him during a dinner with CEOs that Trump hosted on Aug. 7. That’s as believable a story as any other — although the dinner happened on Aug. 7, and Trump waited 10 more days to send his tweet. What happened in the intervening 10 days? Foremost, Trump revoked the security clearance of John Brennan, a former CIA director who often notes that Trump is a terrible president and a terrible person. That petty move did Trump no favors, and he needed to change the narrative for the weekend. Then came this tweet, Which changed the narrative for the weekend, at least. The SEC’s Division of Corporation Finance continues to study public company reporting requirements, including the frequency of reporting. As always, the SEC welcomes input from companies, investors, and other market participants as our staff considers these important matters. I have no doubt that the SEC already was considering the merits of semiannual reporting, perhaps with reduced disclosure during intervening quarters. Clayton’s statement, however, strikes me as someone telling a senile parent that yes, dad, we’ll ask the nursing home staff right away whether they’re stealing your shoes. The larger question is whether semiannual reporting solves the problem of short-term corporate focus — which is a problem. Alas, what Trump wants to do here won’t help. The compliance and governance communities use the phrase “short-termism” so often that we should start by remembering what the phrase actually means. It means shareholders are so eager to extract value from the company, in the form of profits or rising share price, that they will force management to deliver more profit and growth in the immediate period even if the strategies to do so weaken the company over the long term. Well, how do you get management to deliver short-term results even at the expense of long-term viability? You pay them to do that. So right away, one root cause of short-termism is executive compensation. Over the last 30 years we’ve developed a compensation structure that aligns CEO pay with shareholder interests. No wonder CEO pay and Wall Street have boomed in parallel during that time. We’re paying CEOs to deliver good results every filing period. How do you get management to deliver short-term results even at the expense of long-term viability? You pay them to do that. So one root cause of short-termism is executive compensation. It doesn’t much matter, however, whether that filing period is three months or six. Executive compensation structures will still compel CEOs to meet Wall Street expectations. That brings us to the other crucial point people overlook. Why are shareholder interests so focused on delivering short-term results in the first place? Let’s not mince words: because hitting those results translates into value, and shareholders want the ability to extract that value and convert it into money. Money provides us security from other risks. Once upon a time we had other vehicles to provide us security from risk: corporate pensions, the promise of Social Security payments in our old age, and stable careers that could provide living wages. Pensions are gone, Social Security may disappear, and stable, living-wage jobs are a crapshoot. So money is the only guarantee we have left. So we want rock-solid assurance that we can extract money from the shares we own, and the best way to do that is to pay CEOs and other senior managers to hit their numbers every filing period. Again, short-term focus is a scourge. It translates into pressure to deliver — and given enough pressure, employees will be tempted to violate laws, regulations, and moral codes. Compliance officers absolutely should keep an eye on discussions about it. But everything we just discussed above would still hold true regardless of whether companies file financial statements quarterly or semiannually. Shareholders will always pressure CEOs to meet their numbers every period, until we have a much broader discussion about how to change the nature of those shareholder interests. The reality is that his notion to cut reporting in half would only add uncertainty to the value of investors’ holdings, not reduce it. If you think that broader discussion is what President Trump had in mind with his tweet, you’re delusional. Trump simply sees corporate reporting as a nuisance to be hacked away as much as possible. The reality is that his notion to cut reporting in half would only add uncertainty to the value of investors’ holdings, not reduce it. For example, investors trying to value a stock that reports semiannually might take their pricing cues on any given day from similar companies and their news, rather than from the company itself. Or we might see even more attempts to clean up reporting errors with a filing period since the period is longer; which creates more room for management to play fast and loose with financial controls, so long as they clean it all up by period’s end. Those are the practices we’re trying to avoid. A blissfully ignorant march to semiannual reporting only makes them more likely. Blissful ignorance, however, is President Trump’s stock and trade. Let’s hope the SEC takes the issue seriously.